What are other names the industry uses for Medical Thermal Imaging? Medical Thermography, Medical Infrared Imaging (MIR), Thermography, Digital Infrared Imaging (DII), Breast Thermography, Breast Thermal Imaging, Medical Infrared Imaging, Digital Infrared Thermal Imaging (DITI), Thermal Imaging, Infrared Thermography and Computerized Thermal Imaging among others. Medical thermal imaging is an imaging method that detects infrared heat from the surface of the body while producing a visual heat-map display. Modern thermography systems utilize sophisticated computerized post-image processing to extract accurate temperature data and other thermovascular information. This detection of infrared heat allows the healthcare provider to analyze and monitor physiological activity. Thermography is supported by over 40 years of research and thousands of published medical studies. FDA clearance was gained in 1982, and from that point thermography started its emergence into hospitals and doctors’ offices. Thermography is also called digital infrared imaging or DII for short. Although medical thermography is not a standalone modality, it works extremely well in conjunction with other tests and procedures to locate possible infrared markers of concern. Medical thermal imaging is a comfortable non-invasive procedure that emits absolutely no radiation and does not come in contact with the body. Common imaging such as X-ray, CT, ultrasound, and MRI look into the body for changes in structure. Thermography is different; it detects the thermal emission of the body’s physiology or function. Thermography gives the clinician an alternate view of possible problematic regions. Thermal imaging systems are currently being used in hospitals, medical centers, and individual practitioners’ offices. More applications using thermography are still being explored and utilized. What are the benefits of using Medical Infrared Imaging? The procedure is simple, fast, performed in a relaxing manner, and is 100 percent safe. What separates digital infrared imaging from X-ray, MRI, and other structural imaging methods is its ability to locate infrared markers that may indicate inflammation, circulatory problems, neuropathy, and many other health conditions. The FDA has cleared digital infrared imaging as an adjunctive screening tool to be used with structural imaging methods and other tests to help pinpoint possible problems. What are the most important specifications when purchasing a thermal imaging camera? With regard to the imaging camera itself- the absolute detector resolution (ex. 640×480), spatial resolution, sensitivity, frame rate, spectral band and the type of bolometer are good starting points. The quality of the digital imaging software is also of extreme importance. The ideal imaging system provides exceptional image quality while providing ease-of-use. Please click here for more important information. How important are the indications for use when purchasing a thermal imaging system? It is very important to pay attention to the FDA 510K registration indications for use. Indications for use specify what the imaging system can be used for. Always ask for the FDA 510K indications for use when thinking about purchasing a medical thermography system. If the indications for use do not specifically list things like breast cancer screening and other health conditions, it is unclear what the FDA will allow you to use the system for. What are the FDA 510(k) indications of use for the Spectron IR system? 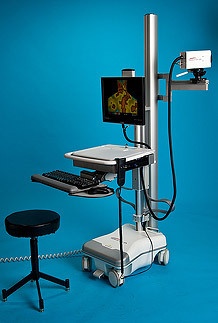 The Spectron IR Clinical Infrared Imaging System is intended for adjunctive diagnostic screening for the detection of breast cancer and other uses such as: peripheral vascular disease, neuromusculoskeletal disorders, extracranial cerebral and facial vascular disease, thyroid gland abnormalities, and various other neoplastic, metabolic and inflammatory conditions. Use of Spectron IR cameras is not intended to be a stand-alone procedure for these diseases and conditions. What are the benefits of having single keystroke software? The benefits of having single keystroke software include: speed, ease-of-use, and functionality. Why use a mouse to hunt for a drop-down menu, move down the list, click on the function and wait for it to occur. With a single keystroke everything is done and the action occurs. Does Spectron IR offer any other choices in camera mounts and systems? Spectron IR offers many different system configurations. As a manufacturer of Spectron IR cameras and configurations as well as a FLIR authorized dealer, Spectron IR offers the widest variety of infrared cameras and system configurations. Choose from Entry systems that include only the camera, computer/laptop, and Spectron IR’s full professional software all the way up to our hospital grade Pro Cart and Wall Mounted systems. We also provide different configurations for mobile systems and can provide professional systems that include quick and easy mobile conversions. What is the warranty for the Spectron IR System? We provide a full one year parts and labor warranty for the Spectron IR system. We additionally provide superior customer service with a well trained staff that includes certified thermography technicians.